Alpukat = Persea americana Mill. 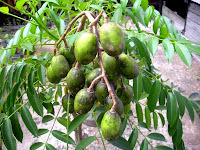 Ampalam (Asem) = Mangifera sp. Belimbing = Averhoa bilimbi L. atau Averhoa Carambola L.
Cempedak = Artocarpus Integra Merr. Durian = Durio zibethinus L.
Duku (Langsat) = Lansium domesticum Correa. Jeruk Bali = Citrus maxima Merr. Jeruk Keprok = Citrus nobilis Lour. Jeruk Manis = Citrus sinensis Osb. Jeruk Nipis = Citrus aurantifolia Swingle. Kedondong = Lannea grandis Engl. Ketapi Suntul = Sandoricum koetjape Merr. Mengkudu = Morinda citrifolia L.
Nenas = Ananas comosus Merr. Ramania (Gandaria) = Bouea macrophylla Griff. Rambutan = Niphelium lappaceum L.
thanks a lot for her information,,, it really means a lot to the students and teachers, and even professors once ..